A Cabana Hale Kölea é uma cabana de madeira personalizada e aluguel de temporada legalmente operada, localizada no bairro rural de Talkeetna, a apenas 15 minutos a pé do famoso bairro histórico. Somos um estabelecimento sem fumo, sem PETS e #OpenToAll que mede 57,13 m² e foi concebido com um layout de estúdio aberto e acolhedor (sem quartos). Hale Kolea cabana é um refúgio ideal para duas pessoas com uma cama de casal disponível. As comodidades modernas incluem: Wi-Fi de banda dupla, Smart TV Samsung 4K Ultra HD (sem cabo ou satélite), leitor de Blu-ray / DVD com biblioteca de filmes, estéreo Sony i-Dock / Bluetooth e sauna finlandesa. Hale Kolea cabana é um registro HOST cabine NO com uma cozinha de aço inoxidável totalmente equipada e lavandaria separada. O spa-como casa de banho possui um chuveiro com paredes de vidro de luxo, com piso de cascalho e um costume em suite sauna finlandesa. Mobiliário de Hale Kolea cabine foram meticulosamente selecionado para reflectir uma sensibilidade havaiana e incluem itens como travesseiros havaianas mão acolchoado, arte personalizada e pisos de madeira sólida bordo deslumbrante. Hale Kölea Cabin aluguer de férias está comprometida com a sustentabilidade usando: iluminação LED / CFL, aparelhos eficientes ENERGY STAR, janelas, portas e isolamento; Armários com certificação ESP, bancadas de quartzo recicladas e produtos e suprimentos de limpeza biodegradáveis. Absolutely prefect! We could not have asked for a better weekend getaway at the Hale Kolea cabin. We loved that we could easily cook and relax, or take a short walk to go out to dinner. It was easy to navigate to, too. If we wanted to walk around and enjoy some fresh air, we had access to tons of trails; even with snow on the ground, it was perfect for walking. Just an overall excellent experience, and so convenient and quiet. We were welcomed with a box of chocolate from Hawaii, which was such a treat! The cabin itself, exceeded our expectations. With all its amenities, you could forget something and then BAM, they have it! We did not have anything negative to say about our 2 night 3 day stay, other than having to leave! We could have stayed there a whole entire week and been very happy. Inside, you will find the cabin is heated by a small heater-which kept us very toasty. The bed was so comfortable and warm, the dining table was excellent for breakfast and allowed view of outside while eating. Tiny sparrows were snacking outside, we just loved how many birds there were. And our drive from Eagle River, we saw 25 moose!! And then of course; the sauna, what a treat! We will for sure recommend the hale kolea cabin, and will request to stay here again in the future! Thank you for everything, again you have exceeded our expectations. A must stay while visiting Talkeetna! Brittany, we are delighted that you had such a stellar experience at our home, Hale Kōlea Cabin! Thank you for finding us in a sea of great places to stay in beautiful Talkeetna. Winter is one of our favorite seasons to visit and what a wonderful winterland it was this year. Thank you again for your business and for considering us again whenever you need another peaceful respite. Until then, stay safe and happy travels. We just spent a wonderful weekend at this cabin! The cabin is beautiful, just as it is in the pictures. It was the perfect weekend getaway for my husband and I. The small town of Talkeetna was surprisingly busy and the locals were very helpful with recommendations on places to visit. There was a shop just down the street where you could rent fat bikes, snowshoes and skis if you wanted to enjoy some of the winter activities on one of the many trails in the area. I would highly recommend this cabin and look forward to our next stay. Oh, and thank you for the wonderful Hawaiian coffee and chocolates! Denece, thank you for sharing your experience and for choosing to stay at Hale Kōlea Cabin. We are glad you were able to reschedule your visit to charming Talkeetna. Thank you for supporting North Shore Cyclery, which as you mentioned, is a walking-distance outfitter of fat tire bikes and skis to enjoy the winter trails. Please call on us whenever you need another Talkeetna visit. Until then, safe travels! The place was perfect for a couple! We really enjoyed our stay! Loren, thank you for choosing to stay at Hale Kōlea Cabin. We appreciate your business. We're just tickled that you enjoyed a perfect stay! Please call on us whenever you return. Until then, travel well and travel safe! Very cozy, clean and comfortable! Loved the decor and welcome chocolates were a nice touch! Couldn't ask for a better VRBO! 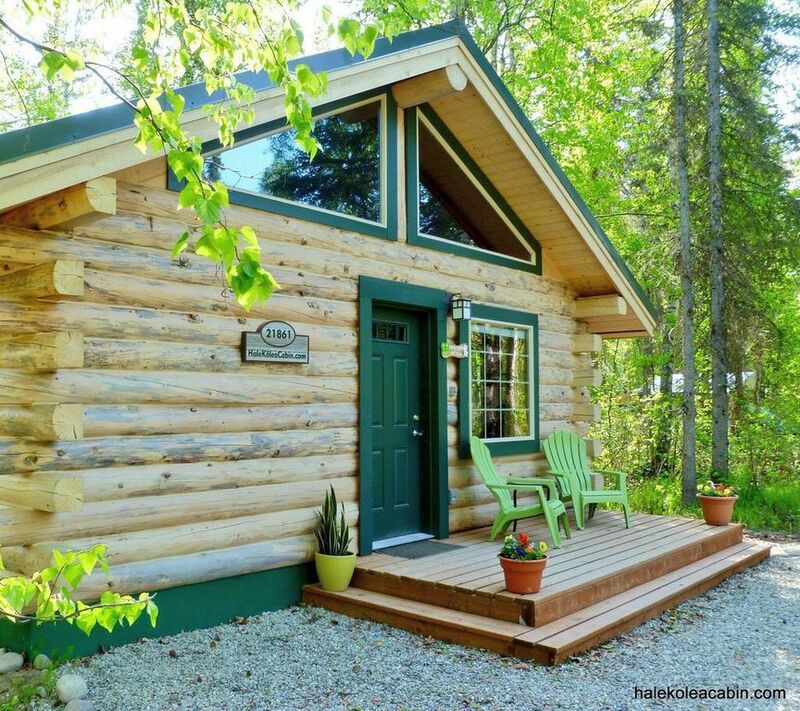 Leslie, thank you for choosing our cozy cabin out of the numerous places to stay in Talkeetna. We appreciate your compliments and are glad to hear you enjoyed the macademia chocolate caramels as part of the many amenities offered. We look forward to hosting your return in the future. Travel well and safe. Happiest of holidays! Amazing cabin a little off the beaten path. This cabin was perfect, cozy with all the essentials. It was a little outside of “town” but still walkable. Loved the large shower and modern amenities. Their website is a wealth of knowledge on things to do and restaurants. They would have gotten a 5 Star if the sauna was working. It would have been so nice to knock the chill off after being out and about. There wasn’t any great hiking close by but Denali State Park was only a 45 min drive with awesome hikes. We also booked a flight from K2 around Denali and it was phenomenal. Lots of fun things to do! Christa, thank you for taking the time to share your experience staying at our home. We appreciate you choosing to stay with us given the multitude of places available now in Talkeetna. Thank you for mentioning the amenities you enjoyed. We felt obliged to call you prior to your arrival that the sauna was inoperable due to past renters flooding the unit with more than the allowed amount of water. We were relieved that your response was that you weren't planning on using the sauna. We understand your change of heart that you felt we slighted you. To provide context, in a small town such as Talkeetna, we were unable to secure an available electrician to alleviate the issue you highlighted for your stay. Unbelievable, but only two electricians were currently in town and both were swamped with prior obligations. Although we couldn't do better given these restraints, our apologies sincerely for tarnishing your expectations. A few days after your stay, our sauna was repaired and working seamlessly. We are actually thankful for this occurance, as we now market as a dry sauna to avoid any shortage due to renter indiscretion. Thank you for the four star review. As you'd agree, there's always room for improvement. We appreciate that challenge and are grateful for you calling us out on it. Please continue to recommend us and consider a return visit in the future. Travel well. Travel wide. Travel safe! We stayed here for a few nights on a 1400-mile road trip around Alaska in mid-August. We loved Talkeetna and this cabin is, from what we saw, the best of all choices here, especially if you want to do stuff on your own schedule. It rained off and on while we were there, but the sound of it on the roof is lovely — and quite nap-inducing! The house is everything it claims to be; a wonderful place for a couple (or solo traveler) to have a refreshing getaway. Treat yourself! Hank, sounds like you had a refreshing and relaxing stay in Talkeetna. Thank you for staying at Hale Kōlea Cabin and considering us the best of the many choices available. Thank you for spreading the news about us and we welcome you should you choose to return and experience Talkeetna in another season. Happy travels! Talkeetna é a "porta de entrada" para o Parque Nacional Denali e uma excelente base para atividades como: passeios para Flightseeing Denali (Mt. McKinley); montanhismo; salmão e pesca com mosca; caça; cavalo de volta livrando; tirolesa; esqui cross country; deserto caminhadas; neve de usinagem; trenós puxados por cães; compras; restaurantes e feiras de artesanato locais. Concertos noite de verão no parque são uma atração favorita para moradores e visitantes. Talkeetna foi a inspiração para a popular série de TV, "Northern Exposure". As festas populares são a Moose sobre o desfile solto e leilão em julho e Winterfest durante todo o mês de dezembro, culminando com o concurso deserto Mulher e Bachelor Auction & Ball. O distrito do centro do núcleo é classificado como um local histórico nacional que inclui edifícios que datam do início de 1900, incluindo a loja geral de Nagley, Fairview Inn eo Talkeetna Roadhouse. Prefeito de Talkeetna é um gato chamado Stubbs. Check in time: 3 pm Check out time: 11 am Discounts automatically applied for stays 7+ nights as follows: May & Sept: 11.42% (approximately $155/night) June thru Aug: 10.26% (approximately $175/night) Oct thru April: 10.3% (approximately $130/night) Unauthorized checkout after 11 am will be subject to a $100 withholding from the incentive/damage deposit. *Note: Credit card processing fee will be deducted from any incentive/damage deposit refund. As of Feb. 16, 2016: all bookings subject to VRBO service fee. #OpenToAll Disclosure: Hale Kōlea Cabin has and will always welcome: ALL Races ALL Religions ALL Countries of Origin ALL Sexual Orientations ALL Genders ALL Abilities You are safe here.